Hey folks, if you're looking for me I'm visiting with my good buddy Don at Beyond Left Field. He's asked me to do a guest post gig over there today and how could I turn a good 'ol boy down. If you don't know Don, let me tell you a little bit about him. If you do know Don, take this with a grain of salt. 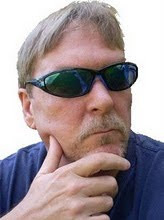 I'm not sure why he calls his blog Beyond Left Field 'cause if anything he's just a little right of Attila the Hun. He lives in Hattiesville, Mississippi where he hangs out with Brett Favre, or his wife, I can't remember which. He has a sickly room-mate who he's always chauffeuring around to the drug store, the hospital, the doctor's, where America shops - oh anywhere - without one word of complaint. He's a believer in the institution of marriage but his three ex-wives might disagree on that point. And he's quite the lady's man, which is why he's living the life of George Clooney. Oh, yeah, he doesn't go anywhere without his glock. Don's a funny, funny guy. I visit him every day for a laugh. Well I don't laugh at him. I laugh at his posts. Well, at least that's what I tell him. And he visits here everyday and leaves some of the funniest comments on my blog. Here's a picture of Don. What a cool guy eh ladies. 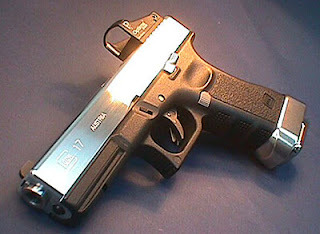 And here's a picture of his glock. I suppose some ladies will like Don because he has a big glock. That aside, drop on over to Don's place today where I'm gonna give you the straight goods - the naked truth, you might say. Thanks for publishing that post I sent you... You're truly a great guy! Don's a hottie. I'd do him. Nothin' sexier than a good ol' boy with a big ol' gun! is that a glock in your pocket or are you just happy...never mind. ♥ Vicki ♥: I'll let him know you're interested. I think he might be available. Everyday Goddess: It's a glock but he may happy to see you, too. RA: Be prepared to cover your eyes. Erm, that's a mighty big gun thar! Quirks: Yeah, don't get on Don's bad side. He's packin'. CL: You won't be disappointed...with the glock.